It won't be long now. Last week, we heard direct from The Predator writer that the first footage was just around the corner. Now we have confirmation from director Shane Black that the trailer is coming soon. Which means we should see it this week sometime. Along with this comes a look at the forest floor, teasing a return to the iconic location from the first movie. We know that some or most of this new Predator sequel will take place in the suburbs. But that's not the only place we'll see the iconic hunter who once stalked Arnold Schwarzenegger through the jungles of Val Verde in Central America's Northern Triangle. As evident in the image below, we'll get some call backs to the 1987 classic. Black gave this ominous warning. Which can only mean one thing. It's trailer time. 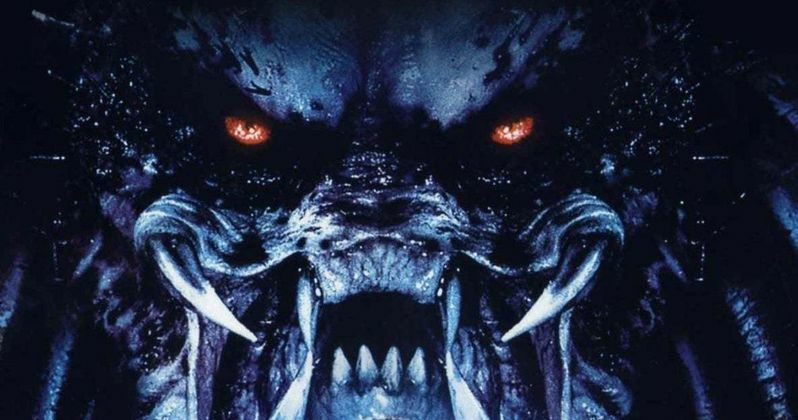 The Predator has been described as a true sequel to the first two movies, and it won't discard the events of the third movie, either. Arnold Schwarzenegger won't be back this time around. Instead, we'll get a team of misplaced military men who escape a prison transport to fight these killers in the asphalt jungle alongside a young kid with autism. There's also been some hints that The Predators will join the humans, for what we don't know. It was confirmed recently that The Predator was undergoing minimal reshoots. Some believed these were being used to bring Schwarzenegger back into the fold, but those rumors are so far unfounded. Test screening reports have been wishy-washy, with the overall consensus being that the movie has too much humor. And that these reshoots where to scrub some of that free, and make it a little darker. The Predator isn't the first attempt to reboot what has come before it. The hunters have fought alongside and against the Xenomorphs from Fox's other massively popular sci-fi franchise Alien, which fans ran lukewarm to. And in 2010 we go the Robert Rodriguez produced Predators, which didn't really do much for the fan base. It sounds like this latest effort will be covering quite a bit of ground as it bounces from space, to the jungle, to the suburbs in a ricochet fashion. The movie was recently pushed from its summer release date of August 3 to September 14. This was done to hope capture some of what IT managed to do at the fall box office. The movie has quite an ensemble cast lined up, led by Thomas Jane, Boyd Holbrook, Olivia Munn, Alfie Allen, Sterling K. Brown, Keegan-Michael Key, Yvonne Strahovski, Jacob Tremblay, Jake Busey, Trevante Rhoades, and Edward James Olmos. You can take a look at the latest location image. The trailer should be dropping very soon, so keep your ears close to the ground, and your entire body covered in mud. Or it's your funeral.